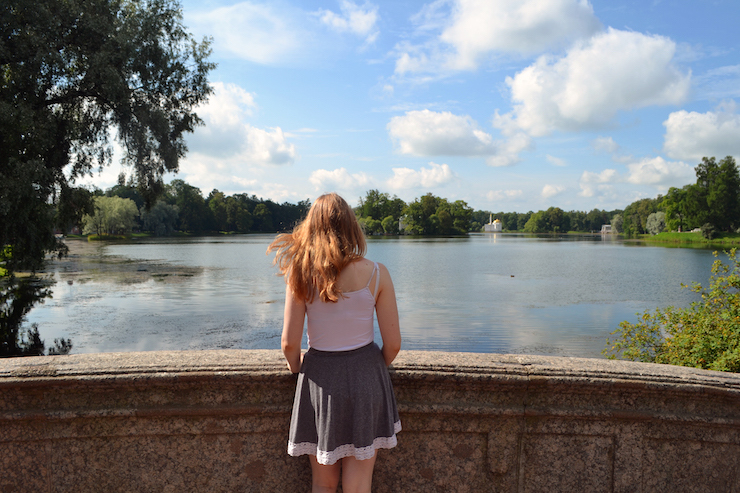 This is a guest post by Annabel Buxton, 17. Annabel went on a summer holiday to Russia with her family. You can read Annabel’s post about their time in Moscow here. This post is about her experience in Russia’s second city, St Petersburg. ‘After four days in Moscow we were taken by mini-bus to the train station and boarded an overnight train to St Petersburg. We had a compartment for four people, with beds and a table. The compartment was comfortable with two bunk beds like a ferry. We ordered our breakfast in the evening ready to be brought to us bright and early the following morning and the only quibble I have is that because it was dark we couldn’t appreciate the countryside views. The hotel, Demetra Art Hotel, was stunning. 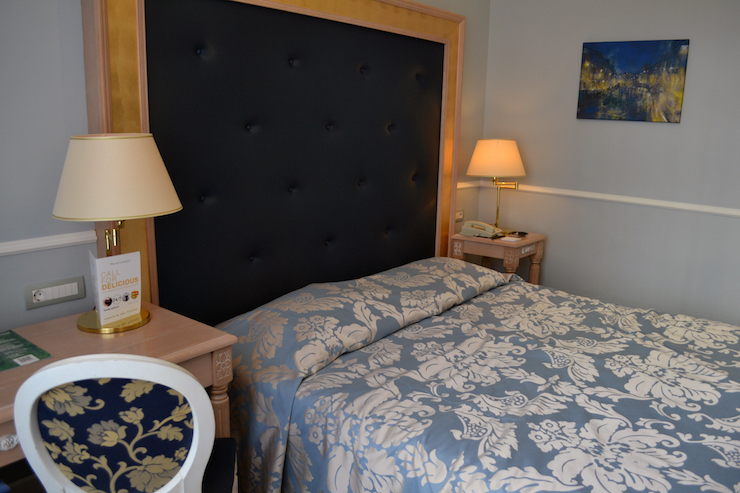 The rooms were spacious and the bed comfortable. The staff were extremely attentive and breakfast in the restaurant was excellent. The bar and small terrace area were perfect for relaxing after a morning tour and the hotel is walking distance from all the major places in the city so it’s easy to explore in your own time. We began our stay with another city tour of major sites and buildings with our guide Olga and an English couple who were on this part of the trip with us. I think the city tours were a perfect start to help us navigate the city on our own. 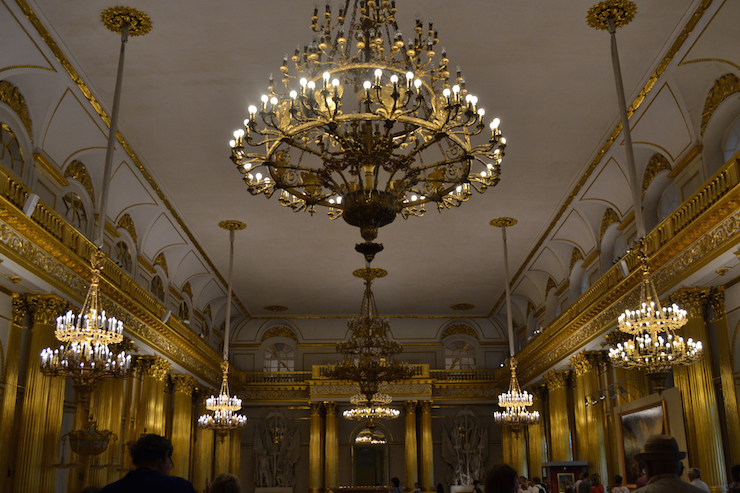 On the second day we visited the Hermitage Museum, which is the largest museum in the world. The main complex is made up of six buildings, five of which are open to the public. The museum was founded by Catherine the Great and the collections are comprised of over three million items, including Catherine’s personal collection of paintings, which were the reason the museum was created and which is now one of the largest collections of paintings in the world. My favourite part of the museum was The War Gallery of 1812 by Carlo Rossi. This is situated within the Winter Palace and commemorates Russian arms in the Napoleonic Wars. The room in which the paintings are situated is beautiful, with a high curved ceiling and a feeling of grandeur that is fitting for a commemoration of war. It is a collection of 332 portraits of the generals who were considered heroes of the 1812 War. The British artist George Dawe created the portraits and if a general died in battle there is an empty frame left to commemorate him. Other exhibitions at the museum range from Ancient Greek art and Culture of the 7th-2nd Centuries B.C. to The Private Rooms of Empress Maria and the beautiful Malachite room within the Winter Palace. 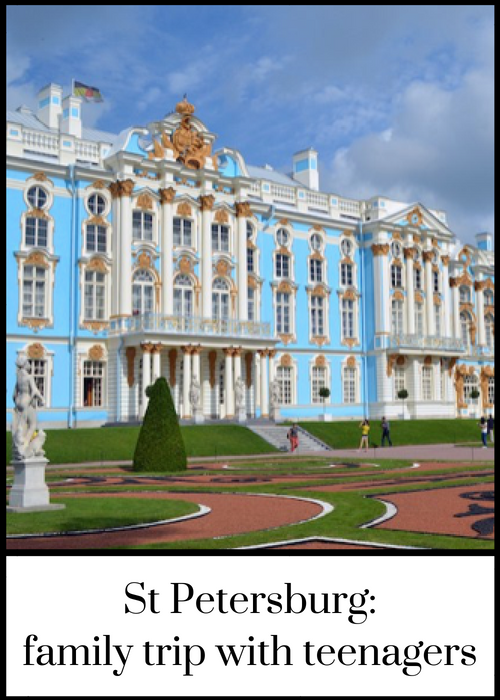 There is a vast range of art and culture to experience and the museum is huge, the Winter Palace alone has 1,057 rooms! Cost: Our tickets were bought in advance by the Russian tourist board and included within the overall price of our trip to Russia. However tickets can be purchased for the Hermitage Museum in advance on their website or at the ticket office. The queue for the ticket office at the museum is extremely long so I would recommend booking in advance. A ticket for the Main Museum Complex and the branches costs $17.95 per person. On the last day we visited Pushkin, the summer residence of the Tsars. This was very interesting and enjoyable although there was a lot of walking. 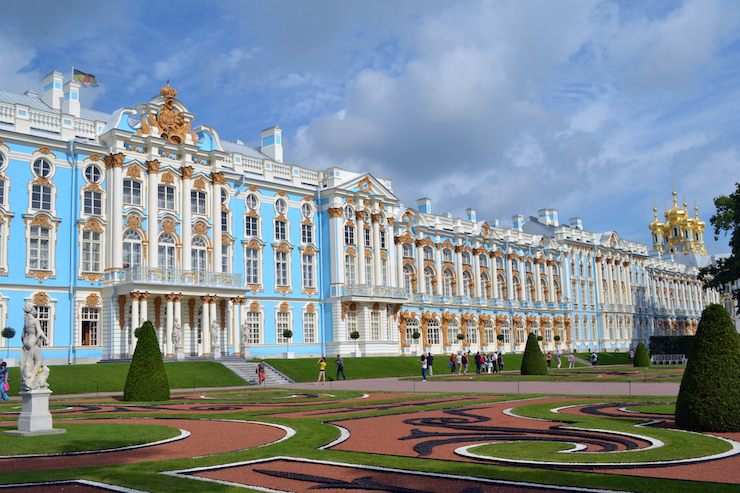 The palace, Catherine Palace, is set in nearly 300 acres of grounds with many pavilions and houses dotted around. This was my favourite part of the trip because we saw the palace as it was during the Tsars’ times, and the stunning grounds and pavilions. Unfortunately it was destroyed under Nazi occupation during the Second World War so the palace is a recreation of the original. Fortunately when the Nazis were approaching many pieces of furniture and decoration were buried or hidden in other parts of Russia to preserve for after the war. The last Tsar to reside in Catherine Palace (named after Catherine I) was Catherine the Great who stayed there during the summer until 1796. Subsequent monarchs favoured the Alexander Palace nearby. Of the 52 rooms in the palace, 29 have been restored to date. This includes the Amber Room that is arguably the most famous room in the palace. The Russian government has spent a lot of money restoring Catherine Palace and although the exact amount is unknown, the Amber Room alone cost $12 million to restore and took 20 years. Unfortunately photos are forbidden within the Amber Room so I cannot share its glory with you! Cost: As with the other visits on our trip, the cost of the ticket was included within the holiday’s price. Individual tickets to Catherine Palace cannot be bought in advance, except through a tour operator and it is compulsory to have a guide. If you purchase from the ticket office on the day then the guide is Russian speaking, although audio-guides can be hired for 150 RUB. The grounds are free to visit and a ticket is only required to enter the palace. The tickets are 320 RUB per person when bought on the day. The restaurants we visited for dinner were all extremely nice. We went to the hotel restaurant and the restaurant Brúxelles, which is a short walk up the road from the hotel, and on the last time evening we went to Mockba on the top floor of the Nevsky centre. This was a 15 minute walk to the end of the road that the hotel is situated on to the main shopping road of St Petersburg. The restaurant was exceptional. I would recommend booking (ask your hotel as they can book for you) as it is very popular and you can then book an outside roof terrace table overlooking St Petersburg. Ultimately I had a fantastic experience on holiday in Russia and would highly recommend booking through the Russian tourist board. They organised everything and allowed us to experience and learn about a country so completely different to our own. If you’ve been to St Petersburg do you have any travel tips to share? If you haven’t been, would you like to go there? You can read about Annabel’s experience in Moscow in her post Visiting Moscow with kids: a teens view. If you’d like a guide book for Moscow or St Petersburg, Annabel used and recommends the DK Eyewitness Top 10 Moscow and Top 10 St Petersburg guides. Great post and love that it’s from a teens point of view showing how much travel and experiences mean to children. Russia looks amazing and was always on my wish list after studying it for ALevels.